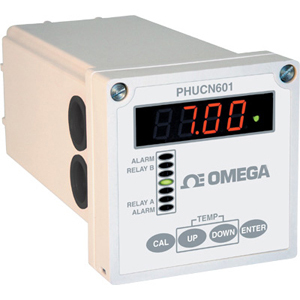 The PHUCN600 Series multi-parameter controller is a microprocessor-based controller capable of measuring one of the following parameters, pH, ORP, or conductivity. When shipped from the factory, the PHUCN600 Series is not set to measure any one parameter.When the PHUCN600 Series is powered up for the first time, it will display the meter selection screen where the meter type must be selected. This meter selection screen will only be displayed when the PHUCN600 Series is powered up for the first time. After the user selects a meter type the PHUCN600 Series will remain set to that meter type until it is changed with the meter selection menu function in the Utilities menu. Outputs, used to configure the PHUCN600 Series outputs. There are two displays on the PHUCN600 Series. A bright LED numeric display with bar graph on the outside front panel, and a 2-line, 16-character LCD display on the inside. The LED readout on the outside panel can be seen several yards away. The distinctive, Color coded bar graph will immediately indicate if you are within the process parameters that you set (green), if the control relays are on (yellow) and if you are in alarm condition (red). This makes diagnosing pump and alarm malfunctions easy. All configuration and control functions are performed on the LCD menu on the inside front panel. A universal mounting kit is included for surface, panel and pipemount applications. The 1/4" DIN enclosure makes panel-mount cutouts and engineering simple. Complete and versatile the PHUTX600 is the 1/4 DIN two wire transmitter which can measure Conductivity, pH or ORP. PHUTX600 comes complete with a universal mounting kit for surface, panel and pipe-mount applications. The NEMA 4X 1/4 DIN enclosure is perfect for stand-alone or panel-mount operation. PHUCN600 and PHUTX600 Series are packaged in a rugged NEMA 4X polycarbonate enclosure making it ideally suited for heavy-duty applications such as industrial wastewater neutralization, municipal water and wastewater, pulp and paper, and process control. The PHE-600-SB Salt Bridge kit required for use of the pH and ORE sensors is sold separately. pH and ORE sensors can not be used without the Salt Bridge kit. Junction box with integrated terminal strip. * Insert cable length in feet. †The PHE-600-SB Salt Bridge kit required for use of the pH and ORE sensors is sold separately. pH and ORE sensors can not be used without the Salt Bridge kit.